Karate will for the first time be included in the Olympic Games being taken place in Tokyo in 2020. Learn not only the basic movement (punching and kicking) but also the spirit of it (Karate-do). The "Dojo" training hall is located in the center of the city and easy to access from Tokyo station. Meet at a office close to the training hall and have a brief lecture and the schedule of what you do. 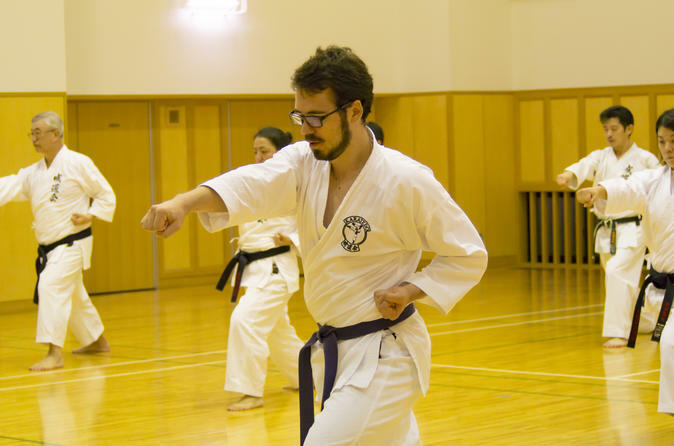 After you move to the training hall, you change clothes to comfortable outfits that you bring or to "Dogi" Karate uniform you can rent (It is necessary to inform us with your height and size of waist when you book). First of all, you learn the greeting, courtesy, manners of Karate. It is really important when you learn the martial arts. And you try to do some applied movements, attack (punching and kicking) and defense! After the Karate experience you can take a shower, or if you pay extra on the spot the public bath is available located next to the Karate training hall.